Geolocation isn’t anything new. It has, in a sense, been around since we began to locate object or places on a map with relative accuracy. Right now you are likely reading this content on a computer screen. Since I use Google Analytics to monitor traffic to my site, I’ll be able to know that someone from your town visited my site. This is because most IP addresses are listed with their supposed location. This is called IP Location. 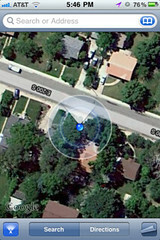 What I’m excited about is how geolocation applies to mobile technology. Many of us use geolocation already and don’t know it. For example: If you took a picture with your location-enabled phone and uploaded it to the web, you likely uploaded the location of where you took the image as part of the image file’s data. Take a look at sites like flickr.com. You can view your photos on a map that shows where the photos were taken. You can even use your phone to see pics taken by others near your current location! You are walking through the downtown area of whatever town is closest to you. Your phone alerts you that it has a message to relay to you. A push notification from an app… It tells you that there is a coffee shop 63 meters from you that is having a happy hour special. Not only that, but 8 of your friends have recommended this business. You look a bit deeper into the location’s entry in the app and you see that one of your good friends signed into the location not 10 minutes ago with the following message: “Having a tasty caramel macchiato while getting some work done”. Was this intrusive? It might seem so for some. But would you stop in to the business and have a coffee with your friend? Probably so. We aren’t too far away from this being reality. Apps like Loopt will already let you know when you are near your friends. For marketers, the bad news is that currently, there aren’t enough users to make the data generated as valuable as it could be. This won’t last long. Yes, it took Facebook years to get to the number of users it has. The good news is that sites like Facebook and Twitter have paved the way for users to accept tools like Foursquare and Gowalla. The growth of these tools has already been explosive. I predict that within the next 12 months, there will be HUGE growth in the geolocation arena. Like social media, it isn’t going anywhere but up. So the question is this: Who has access to the data? We will soon see agreements between the makers of these highly used tools and the big dogs like Google, Microsoft and Facebook. Is this a good thing? While some fear the issues related to privacy, I believe that since marketing isn’t going away, having better data will only result in more targeted advertisements. That said, everyone should be aware of what data they share with the world and consider their safety. I’ll write more on the safety aspect soon. John, I think the question you ask will really determine the long term success of geolocation for the masses. The holder of the data controls the destiny of those using the data. Take for instance Twitter. They have provided API (programming interfaces) into their data for quite a while. Hundreds if not thousands of businesses and services have been built on the back of this API. The huge achilles heel, is when the service goes down, your business, which is fully reliant on Twitter, is now down. There have been some attempts to decouple the data into third party repositories, with common interfaces that allow programmers to connect with all of this data. This is a great start, but there is a lot more work that needs to be done. Al of this data presents several issues, a couple of which you talk about, security and privacy. But beyond those issues, and with the right mix, geolocation application add a tremendous amount of value to consumers. In a previous article you wrote about being able to get comparison pricing in a grocery store, on demand. This is a great idea, and the type of service geolocation and just in time data mining can give consumers.